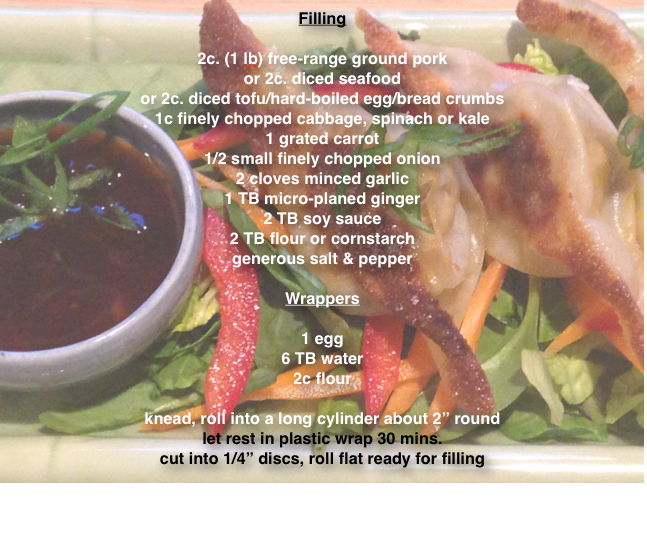 Who doesn’t love a zesty, flavour-filled gyoza, potsticker or wonton! They can be such a delicious bite. As with most things though, I find the pre-made store-bought varieties less than desirable. Even more concerning to me is what exactly they might be filled with?? To answer my need-to-know-what-I-am-eating question, I have found that it is super easy to make my own gyoza right at home. 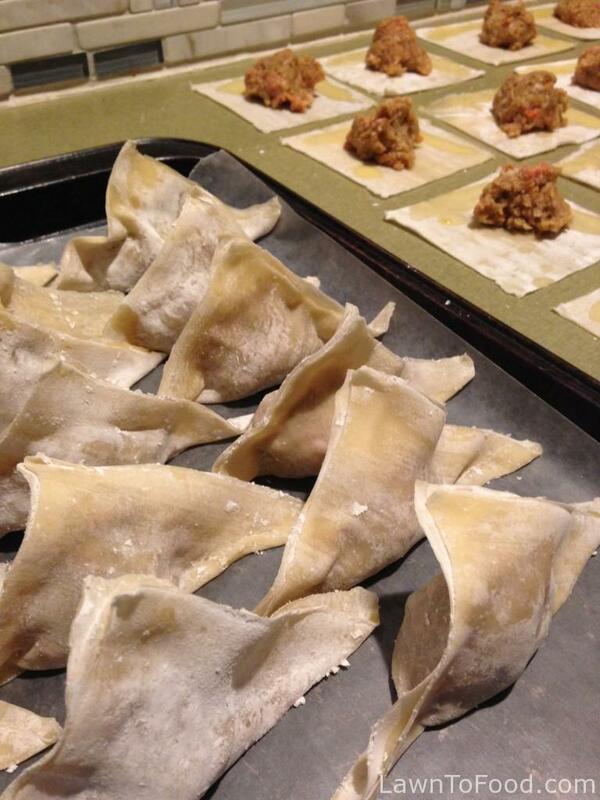 One pound of ground pork ($3), and a package of wonton wrappers ($2.50), with some vegetables can make a whack of gyoza. For even more value-added thriftiness, I do a vegetarian filling with homemade (easy but more time consuming) wrapper dough. Delicious! Recently, I had the family coming to visit so I made up a batch of gyoza to serve as appetizers. I started with my filling mixture of ground free-range pork, shredded cabbage, kale from the winter garden, onion, grated carrot, organic ginger & our garlic with a microplane, and seasonings. When that was completed, I laid out an entire package of 60+ wrappers on my kitchen counter, to prepare them for filling. 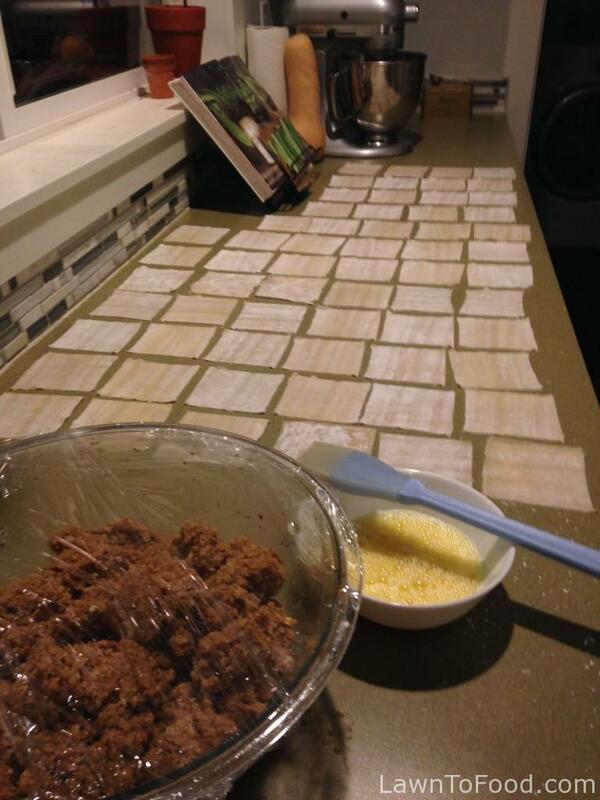 To seal the wrappers, I whisked one egg with a bit of water, and brush that mixture on 2 edges of each wonton wrapper. The egg will “cook” and then seal all of the filling inside of the wrapper. 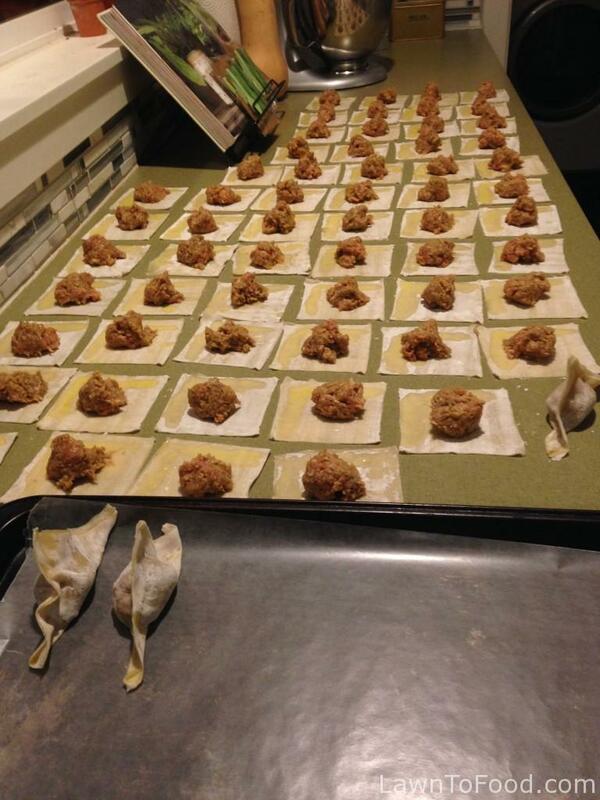 After this step, I used my handy-dandy-mini-scooper to portion out a meatball for each square. In hindsight, these meatballs are slightly too large, but I wanted to use up all of the filling that I had prepared. 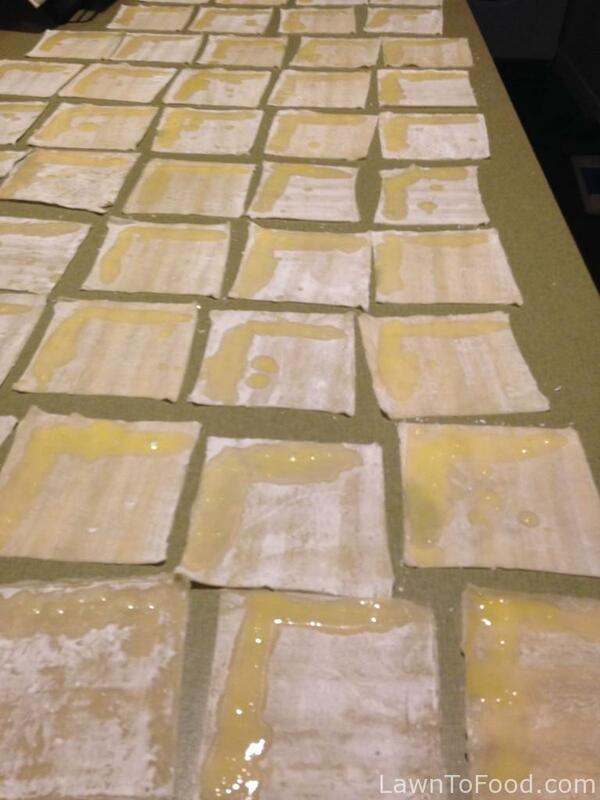 You guessed it … the next step is to fold the wrappers in half and stick the edges together. I placed the finished gyoza on parchment paper lined cookie sheets. If you don’t have any paper, then generously cover the cookie sheets with plain flour, to prevent the gyoza from sticking to the pan. Within minutes, I had the 60 gyoza ready for the freezer, and 3 ready for the frying pan! Taste testing is the BEST part of cooking, so of course, I fried up a few. To cook gyoza, I use the fry-steam-fry method. 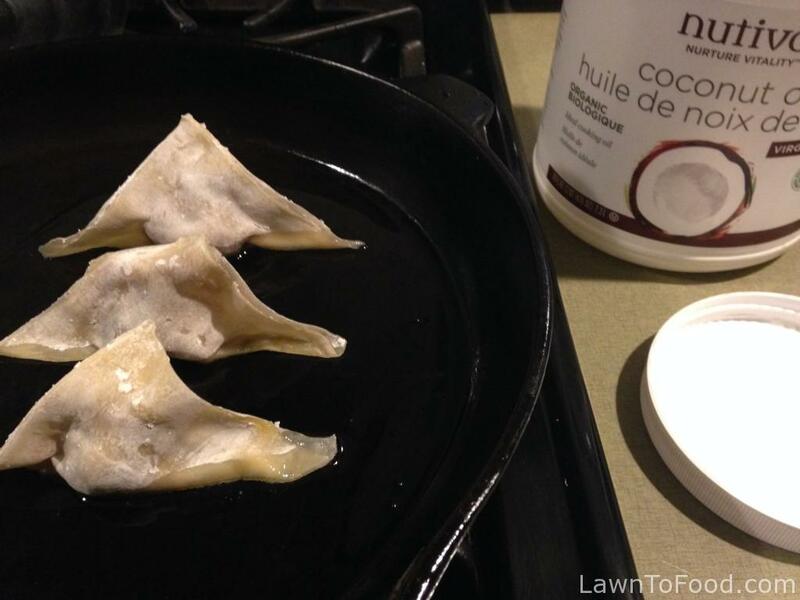 I put a very small amount of coconut oil in the frying pan, heat it and then add a few gyoza. With a lid in hand, I quickly drop 3TB of water into the fry pan and immediately cover. I always hold the lid as a shield, when I add the water. I let the gyoza steam for 3-5 minutes, remove the lid, and flip the gyoza around to brown their sides. While the gyoza are steaming and frying, I made up a dipping sauce of two parts soy sauce, one part rice vinegar and one part sweet Thai chilli sauce, then added a few drops of sesame oil, one clove of minced garlic and sliced green onions. If I find that the dipping sauce is too strong, I add a splash of water. I also love to add more vegetables to plates. For this Asian dish, I made sure to cut cabbage greens into long shreds and julienne pieces, so that they were easy pick up with chopsticks. 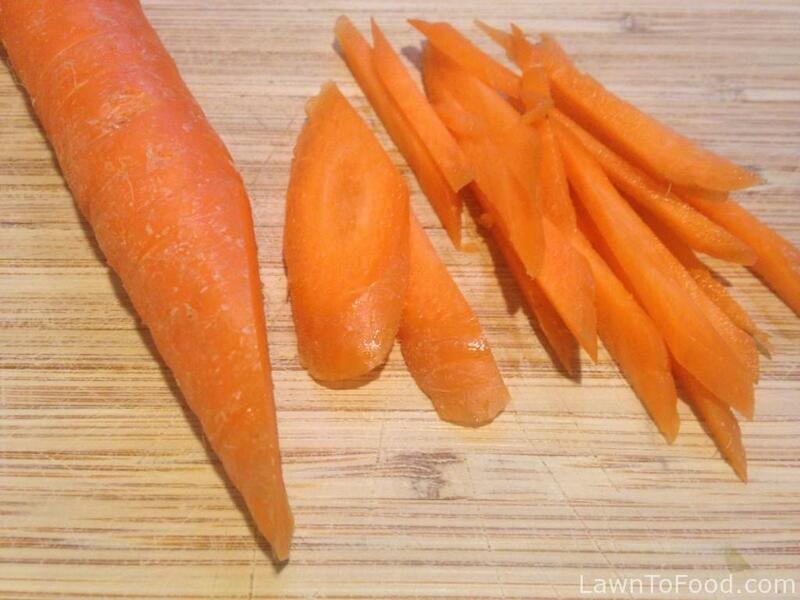 A fast way to julienne carrots is to slice them in long diagonals, and then into thin strips. I wash, but never peel, organic carrots. 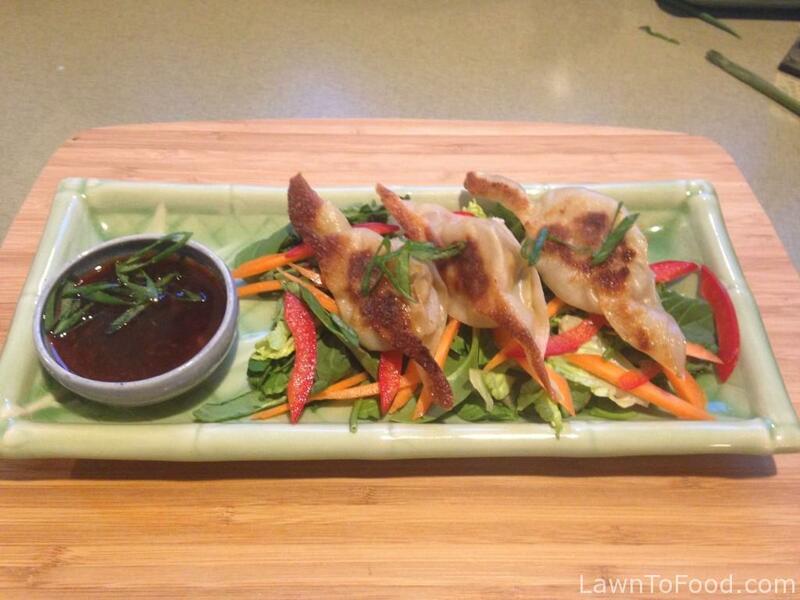 Gyoza are a simple and delicious appetizer, snack or meal. Eating these three gyoza was completely satisfying for me, especially knowing that the other 60 gyoza were in the freezer on cookie sheets! Once they are frozen solid, I will transfer them to freezer bags. Grabbing a handful to fry-steam-fry for guests, or a spring lunch for us, will be very convenient and tasty. As a bonus, these gyoza-potstickers are also something that I can add to simmering Asian broths, for quick and delicious wonton soup. WE LOVE GYOZA over here in this family! Will certainly be making these – thank you again Lynda!